This orange awareness t-shirt was designed to provide inspiration and strength to those who want to support themselves or a loved one. Wear orange to spread awareness for the cause closest to your heart. Our orange shirts work well as multiple sclerosis shirts for any MS walk. 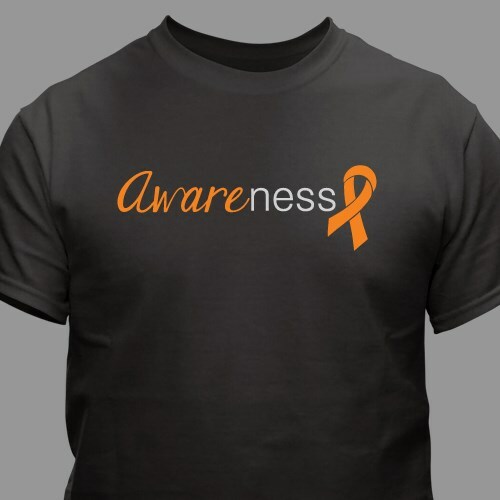 This orange awareness design is available on our premium 100% cotton, black t-shirts. Each shirt is machine washable and comes in youth sizes XS-L and adult sizes S-3XL. The T-shirts that we ordered arrived quickly. The shirts are a nice quality with proper fit for all sizes that we ordered. They have kept their shape and color through several washings. I will definitely purchase again and will strongly reccommend! I like to help to find cure for MS. I will get more of this for my friends and family to help fight this with me . I have two dear friends that are fighting MS - what a great way to support!! Great material - not the 'cheap' cotton you sometimes get.